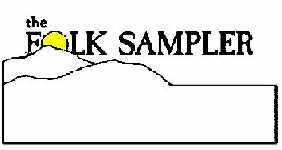 The Folk Sampler is about gardens and home grown tomatoes. It's about making things with your hands. It's about small towns and home- town people. It's about the big cities and the hurry that goes with them. The Folk Sampler is about train whistles in the night and sunshine in the morning. It's about slow moving rivers and the sounds of wooden canoes. It's about horses in the barn, cows in the field, and the people who enjoy taking care of them. It's about working in a factory or plowing in the field. The Folk Sampler is about real people, doing real things. It is about the stories we have to tell and the lives we live.